Except we make the breakfast! Unwind at our inviting hillside inn nestled amidst soaring evergreen trees. Fully renovated in 2016, the rustic, beautifully handcrafted Jackson Hole Hideout is sure to please. This lodge-style property, set on four acres in Wilson, features wood beamed ceilings, plentiful large windows and cozy spaces both indoors and out. It is a comfortable, casually elegant, multi-level home base, providing the peaceful environment you crave as you enjoy all of the natural wonders and outdoor adventures that Jackson Hole and the greater Yellowstone ecosystem have to offer. Sweet dreams indeed! 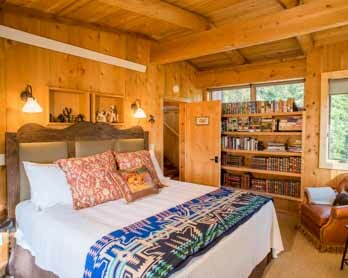 Five individually decorated guest rooms include sumptuous bedding, a private spa-like bathroom, closet, dresser, reading chair, woodland views and access to your own peaceful patio. Here, the most important meal of the day is also the most delicious. Rise and shine with a fresh, hot and filling breakfast…you definitely won’t leave the Hideout feeling hungry! If you’ve never experienced Jackson Hole before, you are in for a treat. And if you have been to the area before, you have never experienced it like this. See why we’re the perfect home base for your Jackson Hole adventures! We liked everything, the location, so quiet and at the same time so easy to get to Grand Teton NP. The suite was well furnished and well equipped. But more than anything else, the owners made us feel at home and it's a great "plus" to have all the guests congregate for breakfast to exchange experiences and impressions. Keep up the good work! If I could have stayed forever, I would have! Absolutely gorgeous, every amenity ever imaginable and not imaginable provided by wonderful owners! This is truly a gem, and we are coming back to Jackson Hole just so we can stay here for the luxurious accommodations, delicious breakfast, wild animal watching in the yard, and the fun checkerboard in the living room. If you stay somewhere else, you will have missed an experience of a lifetime. From the amazing breakfast to the added amenities of sodas, bear spray, chap stick, York peppermint patties, fur blanket, and on and on, this place was ideal. Highest recommendation!! Best hosts ever. If I could give this this B&B a "10" I would. Newly renovated, and renamed. Everything about this home is excellent. The wife and I stayed here for 4 nights while visiting the area. We found the property to be 5 star. Beth and Greg are the new owners and have redone nearly every inch of the property. The Hideout was everything and more than expected. Greg & Beth are terrific and took time to get to know their guests. You’re in for Southern hospitality at the Jackson Hole Hideout in the last of the Old West. For innkeepers Greg and Beth McCoy, the experience of Jackson Hole—authentic, distinctive, majestic, breathtaking—is second only to the first-class experience guests have at the Hideout. We have also created a list of our favorite local secrets. Learn more here! Explore the Beautiful Jackson Hole Area.